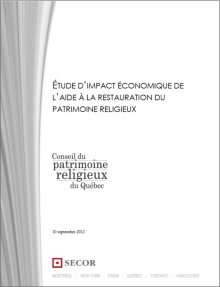 The Québec Religious Heritage Council has contributed to several publications helping to develop a deepen knowledge on religious heritage. Find out here. 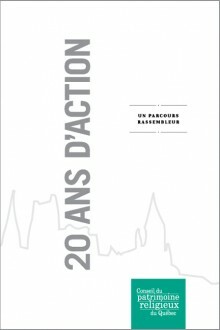 This publication presents a unique look back at 20 years of existence of the Quebec Religious Heritage Council. Designed in the image of this unifying organization, the publication brings together many testimonies and collaborations on the evolution of an unprecedented experience: that of an organization that acts as site manager of an exceptional heritage issue. 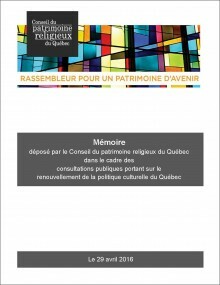 The Québec Religious Heritage Council (CPRQ) wishes to contribute to the development of the future cultural policy of Quebec by sharing its experience and his eyes sharpened by 20 years of involvement in partnership with the Québec government and local communities. The vision of the CPRQ on religious heritage is based on a strengthening of this partnership and redeployment of financial and professional resources to support not only the protection and the enhancement of religious heritage, but also its reappropriation and management by the local communities. The current context, analyzed with rigor but concern by the CPRQ, is calling for new strategies and best organized implications. Faced with the uncertain future of the religious heritage, a concern must underpin the reflection process : the planned actions have to meet the community's real needs while preserving these identitary property. The Ministère de la Culture, des Communications et de la Condition féminine has for over 15 years provided support for our religious heritage through substantial financial assistance for restoration of religious buildings and works of art, as well as for consulting services and activities to mobilize communities in all regions of the province. 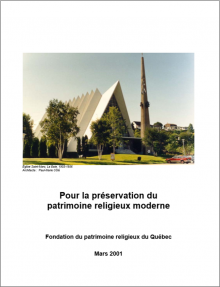 Restoration activities have contributed, over the years, not only to ensure the preservation and enhancement of Quebec’s rich religious heritage but also to create significant repercussions on economic, professional, cultural and regional aspects. This report presents an overview of religious heritage conservation in twelve urban areas in North America, Europe, and Australia. 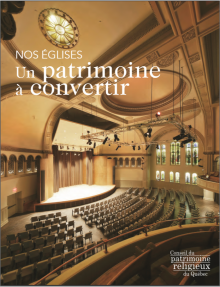 The cases in this survey were chosen by Héritage Montréal and its partners (Québec Religious Heritage Foundation and Groupe Secor) for their comparability with Montreal in terms of demography and relevant heritage experience. This study looks at the current state of religious heritage, focusing on places of worship and their historical roots and features, as well as applicable national and local legal and administrative frameworks. 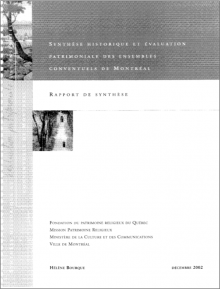 It also examines current concerns, thinking, actions and exemplary practices that could apply to Montreal. In 2003, the Québec Religious Heritage Foundation undertook a vast inventory of places of worship in Quebec. 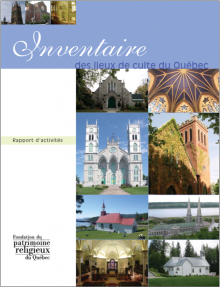 This inventory now provides a overall view on places of worship in Quebec, highlighting the properties of great heritage value, and offering a knowledge tool for successful restorations interventions preserving patrimonial interest. It will also greatly helpful for dissemination about this religious heritage to the citizens of Quebec and an assist in developing cultural touristic projects. This study aims to identify significant heritage properties of religious orders in Montreal. The buildings have been carefully selected to represent key centres of religious orders in the city: mother houses, generalate houses, provincial houses, monasteries, convents, etc. 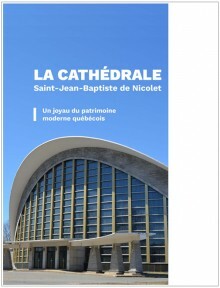 Already in its strategic plan (1999-2002), the Québec Religious Heritage Foundation has shown its concern for the modern heritage and for the extension of existing programs to save the most striking features of this heritage. For this purpose, the Québec Religious Heritage Foundation formed an expert advisory committee in December 2000 and mandated it to make a proposal to the Ministère de la Culture et des Communications du Québec with a view to ensuring protection of our modern religious heritage.